Renewable energy accounted for 12.2 % of total primary energy consumption and 14.94 % of the domestically produced electricity in the United States in 2016.Hydroelectric power is currently the largest producer of renewable electricity in the country, generating around 6.5% of the nation's total electricity in 2016 as well as 45.71% of the total renewable electricity generation. The United States is the fourth largest producer of hydroelectricity in the world after China, Canada and Brazil. The next largest share of renewable power was provided by wind power at 5.55% of total power production, amounting to 226.5 terawatt-hours during 2016. By January 2017, the United States nameplate generating capacity for wind power was 82,183 megawatts (MW). Texas remained firmly established as the leader in wind power deployment, followed by Iowa and Oklahoma as of year end 2016. Solar power provides a growing share of electricity in the country, with over 50 GW of installed capacity generating about 1.3% of the country's total electricity supply in 2017, up from 0.9% the previous year. As of 2016, more than 260,000 people worked in the solar industry and 43 states deployed net metering, where energy utilities bought back excess power generated by solar arrays. Large photovoltaic power plants in the United States include Mount Signal Solar (600 MW) and Solar Star (579 MW). Since the United States pioneered solar thermal power technology in the 1980s with Solar One, several more such power stations have been built. The largest of these solar thermal power stations are the Ivanpah Solar Power Facility (392 MW), southwest of Las Vegas, and the SEGS group of plants in the Mojave Desert, with a total generating capacity of 354 MW. Other renewable energy sources include geothermal, with The Geysers in Northern California the largest geothermal complex in the world. The development of renewable energy and energy efficiency marked "a new era of energy exploration" in the United States, according to the former President Barack Obama. In a joint address to the Congress on February 24, 2009, President Obama called for doubling renewable energy within the following three years. Renewable energy reached a major milestone in the first quarter of 2011, when it contributed 11.7 % of total national energy production (2.245 quadrillion BTU of energy), surpassing energy production from nuclear power (2.125 quadrillion BTU) for the first time since 1997. In his 2012 State of the Union address, President Barack Obama restated his commitment to renewable energy and mentioned the long-standing Interior Department commitment to permit 10,000 MW of renewable energy projects on public land in 2012. Renewable energy technologies encompass a broad, diverse array of technologies, including solar photovoltaics, solar thermal power plants and heating/cooling systems, wind farms, hydroelectricity, geothermal power plants, and ocean power systems and the use of biomass. America needs energy that is secure, reliable, improves public health, protects the environment, addresses climate change, creates jobs, and provides technological leadership. America needs renewable energy. If renewable energy is to be developed to its full potential, America will need coordinated, sustained federal and state policies that expand renewable energy markets; promote and deploy new technology; and provide appropriate opportunities to encourage renewable energy use in all critical energy market sectors: wholesale and distributed electricity generation, thermal energy applications, and transportation. Another benefit of some renewable energy technologies, like wind and solar photovoltaics (PV) is that they require little or no water to generate electricity whereas thermoelectric (fossil fuel based) power plants require vast amounts of water for operation. In 2009, President Barack Obama in the inaugural address called for the expanded use of renewable energy to meet the twin challenges of energy security and climate change. Those were the first references ever to the nation's energy use, to renewable resources, and to climate change in an inauguration speech of a United States president. President Obama looked to the near future, saying that as a nation, the United States will "harness the sun and the winds and the soil to fuel our cars and run our factories." The president's New Energy For America plan calls for a federal investment of $150 billion over the next decade to catalyze private efforts to build a clean energy future. Specifically, the plan calls for renewable energy to supply 10% of the nation's electricity by 2012, rising to 25% by 2025. In his joint address to Congress in 2009, Obama stated that: "We know the country that harnesses the power of clean, renewable energy will lead the 21st. century....Thanks to our recovery plan, we will double this nation’s supply of renewable energy in the next three years... It is time for America to lead again". According to Clean Edge, there's little doubt that the future of energy will be cleaner. The transition from carbon-intensive energy sources like wood, coal, and oil to natural gas and renewables, is well underway. For much of the developed world, and for developing nations, the "future looks increasingly like it will be built off of a mix of energy efficiency, renewables, the electrification of transport, and lower carbon fuels like natural gas". Several mining tragedies globally have underscored the human toll of the coal supply chain. New EPA initiatives targeting air toxics, coal ash, and effluent releases highlight the environmental impacts of coal and the cost of addressing them with control technologies. The use of fracking in natural gas exploration is coming under scrutiny, with evidence of groundwater contamination and greenhouse gas emissions. Concerns are increasing about the vast amounts of water used at coal-fired and nuclear power plants, particularly in regions of the country facing water shortages. Events at the Fukushima nuclear plant have renewed doubts about the ability to operate large numbers of nuclear plants safely over the long term. Further, cost estimates for “next generation” nuclear units continue to climb, and lenders are unwilling to finance these plants without taxpayer guarantees. Percentage of electricity in the US generated from renewable sources 1950-2012; hydropower in blue and other renewable sources in red. Notes: 1 Total electricity energy generation by US utilities. 2 Estimated Solar small scale photovoltaics US Generation 3 Sum of US utility generation and solar small scale generation 4 Solar utility generation and solar small scale extimate 5 Bio includes Wood, wood derived products, waste, landfill gas, and other. Bio Other includes Waste, Landfill Gas, and Other. Solar includes Utility Scale Photovoltaics and Thermal. Renewable energy accounted for 14.94% of the domestically produced electricity in 2016 in the United States. This proportion has grown from just 7.7% in 2001, although the trend is sometimes obscured by large yearly variations in hydroelectric power generation. Most of the growth since 2001 can be seen in the expansion of wind generated power, and more recently, in the growth in solar generated power. Renewable energy in California is prominent, with around 29% of electricity coming from RPS-eligible renewable sources (including hydropower). The United States has some of the best renewable energy resources in the world, with the potential to meet a rising and significant share of the nation's energy demand. A quarter of the country's land area has winds strong enough to generate electricity at the same price as natural gas and coal. Many of the new technologies that harness renewables—including wind, solar, geothermal, and biofuels—are, or soon will be, economically competitive with the fossil fuels that meet 85% of United States energy needs. Dynamic growth rates are driving down costs and spurring rapid advances in technologies. Wind power and solar power are becoming increasingly important relative to the older and more established hydroelectric power source. By 2016 wind power covered 37.23% of total renewable electricity production against 43.62 % for hydroelectric power. The remaining share of power was generated by biomass at 10.27%, solar power at 6.03% and geothermal with 2.86 % of total renewable generation. In 2015, Georgetown, Texas became one of the first American cities to be powered entirely by renewable energy, choosing to do so for financial stability reasons. The United States consumed about 4,000 TWh of electricity in 2012, and about 98 quadrillion BTU (30,000 TWh) of primary energy. Efficiency improvements are expected to reduce usage to 15,000 TWh by 2050. Note: Biomass includes wood and wood derived fuel, landfill gas, biogenic municipal solid waste and other waste biomass. Using data from Electric Power Annual 2014 the expected changes in generating capabilities for different fuel sources is shown in the chart-2015-2019 Electric Power Annual Capacity Projections. Looking only at the renewable fuel sources, a total of 206.2 Gigawatts of renewable would be available by 2019. This is up 36 Gigawatts (+21.1%) from 2014. Using this generating capability and the capacity factors from 2014 data will result in a total of 627.7 terawatt-hours (TWh) of renewable electric energy in 2019. This would be up 89.4 TWh (+16.7%) from 2014. Hydroelectric power is currently the largest producer of renewable power in the United States. It produced 79.89 TWh which is 7% of the nation's total electricity in 2018 and provided 40.9% of the total renewable power in the country. The United States is the fourth largest producer of hydroelectricity in the world after China, Canada and Brazil. The Grand Coulee Dam is the 5th largest hydroelectric power station in the world and another six U.S. hydroelectric plants are among the 50 largest in the world. The amount of hydroelectric power generated is strongly affected by changes in precipitation and surface runoff. 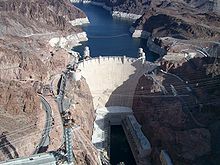 Hydroelectricity projects such as Hoover Dam, Grand Coulee Dam, and the Tennessee Valley Authority have become iconic large construction projects. The 781 MW Roscoe Wind Farm in Texas, at sunrise. Wind power capacity in the United States tripled from 2008 to 2016, and supplied over 5% of the country's total electricity generation in 2016. Wind and solar accounted for two-thirds of new energy installations in the United States in 2015.United States wind power installed capacity exceeds 81 GW as of 2017. This capacity is exceeded only by China. The 1,320MW Alta Wind Energy Center is the largest wind farm in the world. Shepherds Flat Wind Farm in Oregon is the second largest wind farm in the world, completed in 2012, with the nameplate capacity of 845 MW. There were 90,000 wind operations jobs in the United States in 2015. The wind industry in the United States generates tens of thousands of jobs and billions of dollars of economic activity. Wind projects boost local tax bases, and revitalize the economy of rural communities by providing a steady income stream to farmers with wind turbines on their land.GE Energy is the largest domestic wind turbine manufacturer. In 2013 wind power received $5.936 billion in federal funding, which is 37% of all federal funding for electrity generation. The United States has the potential of installing 10 terawatt (TW) of onshore wind power and 4 TW of offshore wind. The U.S. Department of Energy’s report 20% Wind Energy by 2030 envisioned that wind power could supply 20% of all the country's electricity, which included a contribution of 4% from offshore wind power. Additional transmission lines will need to be added, to bring power from windy states to the rest of the country. In August 2011, a coalition of 24 governors asked the Obama administration to provide a more favorable business climate for the development of wind power. The United States is one of the world's largest producers of solar power. The country pioneered solar farms and many key developments in concentrated solar and photovoltaics came out of national research. In 2016, utility scale solar contributed 36.76 TWh to the grid, with 33.367 TWh from photovoltaics and 3.39 TWh from thermal systems. In 2014, 2015, and 2016, EIA estimated that distributed solar generated 11.233 TWh, 14.139 TWh and 19.467 TWh respectively. While utility-grade systems have well documented generation, distributed systems contributions to user electric power needs are not measured or controlled. Therefore, quantitative evaluation of distributed solar to the country's electric power sector has been lacking. Recently, the Energy Information Administration has begun estimating that contribution. Before 2008, most solar-generated electric energy was from thermal systems, however by 2011 photovoltaics had overtaken thermal. At the end of 2016, the United States had 19.77 gigawatts (GW) of installed utility-scale photovoltaic capacity. The United States has some of the largest solar farms in the world. Mount Signal Solar had installed over 600 MW by 2018 and will have 800 MW of capacity upon completion. Solar Star is a 579 megawatt (MWAC) farm near Rosamond, California. Completed in June 2015, it uses 1.7 million solar panels, spread over 13 square kilometres (5.0 sq mi). The Desert Sunlight Solar Farm is a 550 MW solar power plant in Riverside County, California, that uses thin-film solar photovoltaic modules made by First Solar. The Topaz Solar Farm is a 550 MW photovoltaic power plant, in San Luis Obispo County, California. The Blythe Solar Power Project is a 485 MW photovoltaic station planned for Riverside County, California. Many schools and businesses have building-integrated photovoltaic solar panels on their roof. Most of these are grid connected and use net metering laws to allow use of electricity in the evening that was generated during the daytime. New Jersey leads the nation with the least restrictive net metering law, while California leads in total number of homes which have solar panels installed. Many were installed because of the million solar roof initiative. California decided that it is not moving forward fast enough on photovoltaic generation and in 2008 enacted a feed-in tariff. Washington state has a feed-in tariff of 15 ¢/kWh which increases to 54 ¢/kWh if components are manufactured in the state. By 2015, California, Hawaii, Arizona and some other states were lowering payments to distributed solar owners and instituting new fees for grid usage. Tesla and a handful of other companies were promoting household grid-tied batteries while some electric companies were investing in utility-scale grid energy storage including very large batteries. Beginning with the 2014 data year, Energy Information Administration has estimated distributed solar photovoltaic generation and distributed solar photovoltaic capacity. These non-utility scale estimates that the United States, generated the following additional electric energy from such distributed solar PV systems. At the end of 2016 there were 1.76 GW total installed capacity of solar thermal power across the United States. Solar thermal power is generally utility-scale. Prior to 2012, in six southwestern states (Arizona, California, Colorado, Nevada, New Mexico, and Utah) the US Bureau of Land Management owned nearly 98 million acres (400,000 km2) (an area larger than the state of Montana) that was open to proposals for solar power installations. To streamline consideration of applications, the BLM produced a Programmatic Environmental Impact Statement (PEIS). By the subsequent Record of Decision in October 2012, the BLM withdrew 78% of its land from possible solar development, leaving 19 million acres (77,000 km2) still open to applications for solar installations, an area nearly as large as South Carolina. Of the area left open to solar proposals, the BLM has identified 285 thousand acres in 17 highly favorable areas it calls Solar Energy Zones. Solar thermal power plants designed for solar-only generation are well matched to summer noon peak loads in prosperous areas with significant cooling demands, such as the south-western United States. Using thermal energy storage systems, solar thermal operating periods can even be extended to meet base-load needs. A 2013 study by the US National Renewable Energy Laboratory concluded that utility-scale solar power plants directly disturb an average of 2.7 to 2.9 acres per gigawatt-hour/year, and use from 3.5 to 3.8 acres per gW-hr/year for the entire sites. According to a 2009 study, this intensity of land use is less than that of the country's average power plant using surface-mined coal. Some of the land in the eastern portion of the Mojave Desert is to be preserved, but the solar industry is more interested in areas of the western desert, "where the sun burns hotter and there is easier access to transmission lines". 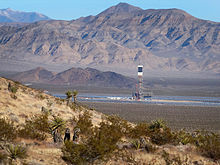 Some of the largest solar thermal power plants in the United States are in the south-west of the country, especially in the Mojave Desert. Solar Energy Generating Systems (SEGS) is the name given to nine solar power plants in the Mojave Desert commissioned between 1984 and 1991. The installation uses parabolic trough solar thermal technology along with natural gas to generate electricity. The facility has a total of 400,000 mirrors and covers 1,000 acres (4 km²). The plants have a total generating capacity of 354 MW. Nevada Solar One generates 64MW of power and in Boulder City, Nevada, and was built by the U.S. Department of Energy (DOE), National Renewable Energy Laboratory (NREL), and Solargenix Energy. Nevada Solar One started producing electricity in June 2007. Nevada Solar One uses parabolic troughs as thermal solar concentrators, heating tubes of liquid which act as solar receivers. These solar receivers are specially coated tubes made of glass and steel. About 19,300 of these 4 metre long tubes are used in the newly built power plant. Nevada Solar One also uses a technology that collects extra heat by putting it into phase-changing molten salts. This energy can then be drawn on at night. Looking north towards the Ivanpah Solar Power Facility's eastern boiler tower from Interstate 15 in California. The Ivanpah Solar Power Facility is a 392 megawatt (MW) solar power facility which is located in south-eastern California. The facility formally opened on February 13, 2014. The Solana Generating Station is a 280 MW solar power plant which is near Gila Bend, Arizona, about 70 miles (110 km) southwest of Phoenix. The 250MW Mojave Solar Project is located near Barstow, California. The Crescent Dunes Solar Energy Project is a 110 megawatt (MW) solar thermal power project near Tonopah, about 190 miles (310 km) northwest of Las Vegas. The United States is the world leader in online capacity and the generation of electricity from geothermal energy. According to 2018 state energy data, geothermal energy provided approximately 16 terawatt-hours (TWh) of electricity, or 0.38% of the total electricity consumed in the country. As of May 2007, geothermal electric power was generated in five states: Alaska, California, Hawaii, Nevada, and Utah. According to the Geothermal Energy Association's recent report, there were 75 new geothermal power projects underway in 12 states as of May 2007. This is an increase of 14 projects in an additional three states compared to a survey completed in November 2006. The most significant catalyst behind new industry activity is the Energy Policy Act of 2005. This Act made new geothermal plants eligible for the full federal production tax credit, previously available only to wind power projects. It also authorized and directed increased funding for research by the Department of Energy, and gave the Bureau of Land Management new legal guidance and secure funding to address its backlog of geothermal leases and permits. The contribution over the last fifteen years of geothermal power to the renewable power generation and to the total US power generation is shown below along with the yearly profile of the geothermal power generation for 2018 (2017) where 2.54 (2.48) GW of capacity produced 16.73 (15.93) TWh of Energy. In 2018, biomass generated 62.76 terawatt-hours (TWh) of electricity, or 1.50% of the country's total electricity production. Biomass was the largest source of renewable primary energy in the US, and the fourth-largest renewable source of electrical power in the US, after hydropower,wind and solar. The contribution from these two categories over the last fifteen years of biomass electric power to the renewable power generation and to the total US power generation is shown below along with the yearly profile of the electric power generation for 2018 and 2017. This shows the typical variations over the months of the year due to fuel availability and needs. Wave power in the United States is under development in several locations off the east and west coasts as well as Hawaii. It has moved beyond the research phase and is producing reliable energy. Its use to-date has been for situations where other forms of energy production are not economically viable and as such, the power output is currently modest. But major installations are planned to come on-line within the next few years. The U.S. Department of Energy stated (in 2006) that more than 1.5 million homes and businesses were currently using solar water heating in the United States, representing a capacity of over 1,000 megawatts (MW) of thermal energy generation. It predicted that another 400 MW was likely to be installed over the next 3–5 years. Assuming that 40 percent of existing homes in the United States have adequate access to sunlight, 29 million solar water heaters could be installed. Solar water heaters can operate in any climate. Performance varies depending on how much solar energy is available at the site, as well as how cold the water coming into the system is. The colder the water, the more efficiently the system operates. Solar water heaters reduce the need for conventional water heating by about two-thirds and pay for their installation within 4 to 8 years with electricity or natural gas savings. Compared to those with electric water heaters, Florida homeowners with solar water heaters save 50 to 85 percent on their water heating bills, according to the Florida Solar Energy Center. Many cars sold in the U.S. since 2001 are able to run on blends of up to 15% ethanol. Older cars in the United States can run on blends of up to 10% ethanol. Motor vehicle manufacturers already produce vehicles designed to run on much higher ethanol blends. Ford, DaimlerChrysler, and GM are among the automobile companies that sell “flexible-fuel” cars, trucks, and minivans that can use gasoline and ethanol blends ranging from pure gasoline up to 85% ethanol (E85). By mid-2006, there were approximately 6 million E85-compatible vehicles on the road. Ninety-five percent of gasoline sold in the U.S.(2016) is blended with 10% ethanol. There are challenges in moving to higher blends, however. Flex-fuel vehicles are assisting in this transition because they allow drivers to choose different fuels based on price and availability. The Energy Independence and Security Act of 2007, which calls for 15.2 billion US gallons (58,000,000 m3) of biofuels to be used annually by 2012, will also help to expand the market. 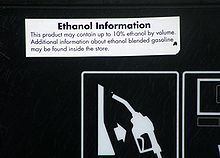 The USDA in 2015 began offering grants to help gasoline retailers install blender pumps for dispensing mid-level ethanol blends. The expanding ethanol and biodiesel industries are providing jobs in plant construction, operations, and maintenance, mostly in rural communities. According to the Renewable Fuels Association, the ethanol industry created almost 154,000 jobs in 2005 alone, boosting household income by $5.7 billion. It also contributed about $3.5 billion in tax revenues at the local, state, and federal levels. On the other hand, in 2010, the biofuel industry received $6.64 billion in federal government support. Both Sandia National Laboratories and the National Renewable Energy Laboratory (NREL), have heavily funded solar research programs. British Petroleum was also heavily invested in solar research programs until 2008 when the company began scaling back its solar operations. The company finally shut down its forty-year-old solar business after executives decided solar power production is not economically competitive. The NREL solar program has a budget of around $75 million and develops research projects in the areas of photovoltaic (PV) technology, solar thermal energy, and solar radiation. The budget for Sandia’s solar division is unknown, however it accounts for a significant percentage of the laboratory’s $2.4 billion budget. Several academic programs have focused on solar research in recent years. The Solar Energy Research Center (SERC) at University of North Carolina (UNC) has the sole purpose of developing cost effective solar technology. In 2008, researchers at Massachusetts Institute of Technology (MIT) developed a method to store solar energy by using it to produce hydrogen fuel from water. Such research is targeted at addressing the obstacle that solar development faces of storing energy for use during nighttime hours when the sun is not shining. In February 2012, North Carolina-based Semprius Inc., a solar development company backed by German corporation Siemens, announced that they had developed the world’s most efficient solar panel. The company claims that the prototype converts 33.9% of the sunlight that hits it to electricity, more than double the previous high-end conversion rate. Wind energy research dates back several decades to the 1970s when NASA developed an analytical model to predict wind turbine power generation during high winds. Today, both Sandia National Laboratories and National Renewable Energy Laboratory have programs dedicated to wind research. Sandia’s laboratory focuses on the advancement of materials, aerodynamics, and sensors. The NREL wind projects are centered on improving wind plant power production, reducing their capital costs, and making wind energy more cost effective overall. The Field Laboratory for Optimized Wind Energy (FLOWE) at Caltech was established to research renewable approaches to wind energy farming technology practices that have the potential to reduce the cost, size, and environmental impact of wind energy production. As the primary source of biofuels in North America, many organizations are conducting research in the area of ethanol production. On the Federal level, the USDA conducts a large amount of research regarding ethanol production in the United States. Much of this research is targeted toward the effect of ethanol production on domestic food markets. The National Renewable Energy Laboratory has conducted various ethanol research projects, mainly in the area of cellulosic ethanol. Cellulosic ethanol has many benefits over traditional corn based-ethanol. It does not take away or directly conflict with the food supply because it is produced from wood, grasses, or non-edible parts of plants. Moreover, some studies have shown cellulosic ethanol to be more cost effective and economically sustainable than corn-based ethanol. Sandia National Laboratories conducts in-house cellulosic ethanol research and is also a member of the Joint BioEnergy Institute (JBEI), a research institute founded by the United States Department of Energy with the goal of developing cellulosic biofuels. Over $1 billion of federal money has been spent on the research and development of hydrogen fuel in the United States. Both the National Renewable Energy Laboratory and Sandia National Laboratories have departments dedicated to hydrogen research. A 2010 survey conducted by Applied Materials shows that two-thirds of Americans believe solar technology should play a greater role in meeting the country's energy needs. In addition, "three-quarters of Americans feel that increasing renewable energy and decreasing U.S. dependence on foreign oil are the country's top energy priorities". According to the survey, "67 percent of Americans would be willing to pay more for their monthly utility bill if their utility company increased its use of renewable energy". In a 2010 Chicago Council on Global Affairs public opinion survey, an overwhelming 91 percent believed "investing in renewable energy" is important for the United States to remain economically competitive with other countries, with 62 percent considering this very important. The same poll found strong support for tax incentives to encourage development of renewable energy sources specifically as a way to reduce foreign energy imports. Eight in ten (80 percent) favored tax incentives, 47 percent strongly, and only 17 percent were opposed. The Chicago Council on Global Affairs ( 2010 ) in the public opinion survey also found that approximately 65% of the Americans supported increased fuel efficiencies of the products of the auto makers , irrespective of the price escalation that would be associated with the implementation . Public Surveys conducted by WPO in 2008 also revealed that 79% of the Americans were of the notion that a major shift to alternative sources of energy is economically beneficial in the long run . Energy technologies receive government subsidies. In 2013, federal government energy-specific subsidies and supports for renewables, fossil fuels, and nuclear power were $15.043 billion, $3.431 billion and $1.66 billion respectively. The subsidies and supports specific to electricity production amount to $11.678 billion, $1.591 billion and $1.66 billion respectively. All but a few U.S. states now have incentives in place to promote renewable energy, while more than a dozen have enacted new renewable energy laws in recent years.[when?] Renewable energy suffered a political setback in the United States in September 2011 with the bankruptcy of Solyndra, a company that had received a $535 million federal loan guarantee. The Energy Policy Act of 2005 requires all public electric utilities to facilitate net metering. This allows homes and businesses performing distributed generation to pay only the net cost of electricity from the grid: electricity used minus electricity produced locally and sent back into the grid. For intermittent renewable energy sources this effectively uses the grid as a battery to smooth over lulls and fill in production gaps. Some jurisdictions go one step further and have instituted feed-in tariff, which allows any power customer to actually make money by producing more renewable energy than is consumed locally. From 2006-14, US households received more than $18 billion in federal income tax credits for weatherizing their homes, installing solar panels, buying hybrid and electric vehicles, and other "clean energy" investments. These tax expenditures went predominantly to higher-income Americans. The bottom three income quintiles received about 10% of all credits, while the top quintile received about 60%. The most extreme is the program aimed at electric vehicles, where the top income quintile received about 90% of all credits. Market mechanisms have less skewed distributional effects. The American Recovery and Reinvestment Act of 2009 included more than $70 billion in direct spending and tax credits for clean energy and associated transportation programs. This policy-stimulus combination represents the largest federal commitment in United States history for renewable energy, advanced transportation, and energy conservation initiatives. These new initiatives were expected to encourage many more utilities to strengthen their clean energy programs. While the Department of Energy has come under criticism for providing loan guarantees to Solyndra, its SunShot initiative has funded successful companies such as EnergySage and Zep Solar. In his January 24, 2012, State of the Union address, President Barack Obama restated his commitment to renewable energy, stating that he “will not walk away from the promise of clean energy.” Obama called for a commitment by the Defense Department to purchase 1,000 MW of renewable energy. He also mentioned the long-standing Interior Department commitment to permit 10,000 MW of renewable energy projects on public land in 2012. Some Environmental Protection Agency facilities in the United States use renewable energy for all or part of their supply at the following facilities. In February 2011, the U.S. Department of Energy (DOE) launched its SunShot Initiative, a collaborative national effort to cut the total cost of photovoltaic solar energy systems by 75% by 2020. Reaching this goal would make unsubsidized solar energy cost-competitive with other forms of electricity and get grid parity . The SunShot initiative included a crowdsourced innovation program run in partnership with Topcoder, during which 17 different solar energy application solutions were developed in 60 days. In 2011, the price was $4/W, and the SunShot goal of $1/W by 2020 was reached in 2017. Wind Powering America (WPA) is another DOE initiative that seeks to increase the use of wind energy. WPA collaborates with state and regional stakeholders, including farmers, ranchers, Native Americans, rural electric cooperatives, consumer-owned utilities and schools. WPA has focused on states with strong potential for wind energy generation but with few operational projects. WPA provides information about the challenges, benefits, and impacts of wind technology implementation. The Solar America Initiative (SAI) is a part of the Federal Advanced Energy Initiative to accelerate the development of advanced photovoltaic materials with the goal of making it cost-competitive with other forms of renewable electricity by 2015. As part of former Governor Arnold Schwarzenegger's Million Solar Roofs Program, California set a goal to create 3,000 megawatts of new, solar-produced electricity by 2017, with funding of $2.8 billion. The California Solar Initiative offers cash incentives on solar PV systems of up to $2.50 a watt. These incentives, combined with federal tax incentives, can cover up to 50% of the total cost of a solar panel system. Financial incentives to support renewable energy are available in some other US states. The EPA named the top 20 partners in its Green Power Partnership that are generating their own renewable energy on-site. Combined, they generate more than 736 million kilowatt-hours of renewable energy on-site each year, enough to power more than 61,000 average U.S. homes. A Renewable Portfolio Standard refers to legislation that creates a market in tradeable renewable or green electricity certificates. Electricity distributors or wholesaler purchasers of electricity are required to source a specified percentage of their electricity (portfolio) from renewable generation sources. Liable entities that fall short of their quota can purchase certificates from accredited suppliers who have generated renewable electricity and obtained and registered certificates to sell on that market. The American Council on Renewable Energy (ACORE), is a non-profit organization with headquarters in Washington, D.C. It was founded in 2001 as a unifying forum for bringing renewable energy into the mainstream of American’s economy and lifestyle. In 2010 ACORE had over 700 member organizations. In 2007, ACORE published Outlook On Renewable Energy In America, a two volume report about the future of renewable energy in the United States. It has been said that this report exposes a "new reality for renewable energy in America." The Environmental and Energy Study Institute (EESI) is a non-profit organization which promotes environmentally sustainable societies. Founded in 1984 by a group of Congressional Members, EESI seeks to be a catalyst that moves society away from environmentally damaging fossil fuels and toward a clean energy future. EESI presents policy solutions that will result in decreased global warming and air pollution; improvements in public health, energy security and rural economic development opportunities; increased use of renewable energy sources and improved energy efficiency. An important part of the mission of the National Renewable Energy Laboratory (NREL) is the transfer of NREL-developed technologies to renewable energy markets. NREL's Technology Transfer Office supports laboratory scientists and engineers in the successful and practical application of their expertise and the technologies they develop. R&D staff and facilities are recognized and valued by industry, as demonstrated through many collaborative research projects and licensed technologies with public and private partners. NREL's innovative technologies have also been recognized with 39 R&D 100 Awards. The Rocky Mountain Institute (RMI) is an organization dedicated to research, publication, consulting, and lecturing in the general field of sustainability, with a special focus on profitable innovations for energy and resource efficiency. RMI is headquartered in Snowmass, Colorado, and also maintains offices in Boulder, Colorado. RMI is the publisher of the book Winning the Oil Endgame. The United States has the potential of installing 11 terawatt (TW) of onshore wind power and 4 TW of offshore wind power, capable of generating over 47,000 TWh. The potential for concentrated solar power in the southwest is estimated at 10 to 20 TW, capable of generating over 10,000 TWh. A 2012 report by the National Renewable Energy Laboratory evaluates the potential energy resources for each state of the United States. In 2010, the United States used 3,754 TWh of electricity. Total energy used in 2010 was 98.16 quadrillion BTU (28,800 TWh, but over 30% is thermal losses). Note: Total use is inflated to create an oil equivalence. ^ "Monthly Energy Review". US Energy Information Administration. 2016-07-12. ^ a b c d e f g h i j k l m n o p q r s t u v w x y "Electric Power Monthly". US Energy Information Administration. ^ "Primary Energy Production by Source" (PDF). US Energy Information Administration. 2017-07-12. ^ "AWEA 2016 Fourth Quarter Market Report". AWEA. American Wind Energy Association. Archived from the original on 2017-02-11. Retrieved 9 February 2017. ^ Editorial Board (26 April 2014). "The Koch Attack on Solar Energy". New York Times. ^ "National Solar Jobs Census". The Solar Foundation. ^ a b c "SEGS I, II, III, IV, V, VI, VII, VIII & IX". fplenergy.com. Archived from the original on 2014-08-05. ^ "President Obama Touts Clean Energy on Earth Day". Archived from the original on 2009-04-29. ^ Ron Pernick and Clint Wilder (2012). "Clean Tech Nation" (PDF). p. 5. ^ "Total Energy". US Energy Information Administration. ^ "Remarks of President Barack Obama -- Address to Joint Session of Congress". 24 February 2009. ^ Ron Pernick (2012). "Clean Energy Trends 2012" (PDF). Clean Edge. p. 6. ^ Synapse Energy Economics (November 16, 2011). "Toward a Sustainable Future for the U.S. Power Sector: Beyond Business as Usual 2011" (PDF). ^ a b "Electric Power Monthly" (PDF). US Energy Information Administration. ^ "Renewables Portfolio Standard Quarterly Report 1st and 2nd Quarter 2012" (PDF). California Public Utilities Commission. Archived from the original (PDF) on 2013-02-03. Retrieved 26 March 2013. ^ a b c "Renewables Becoming Cost-Competitive With Fossil Fuels in the U.S." Worldwatch Institute. ^ "Texas City Leads The Way On Renewable Energy". NPR.org. ^ "Planned Generating Capacities". US Energy Information Administration. Retrieved 2016-03-07. ^ "Generation Records Fall at Grand Coulee Dam". U.S. Bureau of Reclamation. Archived from the original on 2006-10-07. Retrieved 2006-11-18. ^ a b c d e "Electric Power Annual". US Energy Information Administration. Retrieved 2019-03-05. ^ a b c American Wind Energy Association (2009). Annual Wind Industry Report, Year Ending 2008 Archived 2009-04-20 at the Wayback Machine pp. 9–10. ^ "World's Largest Wind Power Project Moving Forward". 4 November 2011. ^ a b "Strengthening America's Energy Security with Offshore Wind" (PDF). U.S. Department of Energy. April 2012. ^ a b "Direct Federal Financial Interventions and Subsidies in Energy in Fiscal Year 2013". Energy Information Administration. Retrieved 10 November 2015. ^ "Farm Progress - Effective solutions & advertising for US agriculture marketers". Farm Progress Agricultural Marketing. ^ "24 governors ask President to focus on wind energy deployment". Renewable Energy World. 25 August 2011. ^ a b c d "Drilling Down: What Projects Made 2008 Such a Banner Year for Wind Power?". ^ "E.ON Delivers 335-MW of Wind in Texas". ^ "Solar Star, Largest PV Power Plant in the World, Now Operational". GreenTechMedia.com. 24 June 2015. ^ "The Solar Star Projects". ^ "Solar Star I and II". ^ "Washington State Passes Progressive Renewable Energy Legislation". Archived from the original on 2007-02-13. Retrieved 2007-12-16. ^ US Bureau of Land Management, Solar Energy Program, 29 Nov. 2014. ^ "Solar Energy Zones". solareis.anl.gov/sez. Solar Energy Development PEIS Information Center. Retrieved August 24, 2016. ^ a b "Solar PEIS Maps". ^ "Spain pioneers grid-connected solar-tower thermal power" (PDF). Archived from the original (PDF) on 2007-09-27. ^ NREL report firms up land-use requirements for solar Archived 2015-09-07 at the Wayback Machine, National Renewable Energy Laboratory, 30 July 2013. ^ A Mojave power failure A shortfall in Mojave protection bill, Los Angeles Times, editorial, December 26, 2009. ^ Michael R. Blood and Brian Skolof, "Huge thermal plant opens as solar industry grows", Associated Press, February 13, 2014. ^ "DOE Finalizes $737 Million Loan Guarantee to Tonopah Solar Energy for Nevada Project" (Press release). Loan Programs Office (LPO), Dept. of Energy (DOE). September 28, 2011. Archived from the original on 2011-10-15. Retrieved 29 September 2011. ^ "Direct Federal Financial Interventions and Subsidies in Energy in Fiscal Year 2010". Energy Information Administration. Retrieved 29 April 2012. ^ "Defense-scale supercomputing comes to renewable energy research". Sandia National Laboratories. Retrieved 2012-04-16. ^ "Sandia National Laboratories" (PDF). Sandia National Laboratories. Archived from the original (PDF) on 2011-10-20. Retrieved 2012-04-16. ^ *Chakrabarty, Gargi, April 16th, 2009. "Stimulus leaves NREL in cold" Denver Post"
^ a b Chumley, Cheryl. "BP Gives Up on Solar Power". Heartlander Magazine. Heartlander Magazine. Retrieved 28 November 2012. ^ "Stimulus leaves NREL in cold". Denver Post. Retrieved 2012-04-16. ^ "Solar Research". NREL. Retrieved 2012-04-16. ^ "Photovoltaics". Sandia. Retrieved 2012-04-16. ^ "'Major discovery' from MIT primed to unleash solar revolution". MIT News. Retrieved 2012-04-17. ^ "Breakthrough: World's most efficient solar panel". SmartPlanet. Retrieved 2012-04-17. ^ "Wind resource evaluation at the Caltech Field Laboratory for Optimized Wind Energy (FLOWE)" (PDF). Caltech. Archived from the original (PDF) on 2011-12-16. Retrieved 2012-04-17. ^ American Coalition for Ethanol (2008-06-02). "Responses to Questions from Senator Bingaman" (PDF). American Coalition for Ethanol. Archived from the original (PDF) on 2011-10-04. Retrieved 2012-04-02. ^ National Renewable Energy Laboratory (2007-03-02). "Research Advantages: Cellulosic Ethanol" (PDF). National Renewable Energy Laboratory. Archived from the original (PDF) on 2012-01-25. Retrieved 2012-04-02. ^ M.R. Schmer; K.P. Vogel; R.B. Mitchell; R.K. Perrin (2008). "Net energy of cellulosic ethanol from switchgrass". Proceedings of the National Academy of Sciences of the United States of America. 105 (2): 464–469. doi:10.1073/pnas.0704767105. PMC 2206559. PMID 18180449. ^ Sandia National Laboratories. "Biomass". Sandia National Laboratories. Archived from the original on 2012-05-10. Retrieved 2012-04-17. ^ Joint BioEnergy Initiative. "About JBEI". Sandia National Laboratories. Archived from the original on 2012-05-25. Retrieved 2012-04-17. ^ Jeff Wise. "The Truth about hydrogen". Popular Mechanics. Retrieved 2012-04-17. ^ "Large Majorities in US and Europe Endorse Focus on Renewable Energy". World Public Opinion. January 18, 2012. Archived from the original on March 15, 2012. ^ John Broder (October 10, 2011). "The Year of Peril and Promise in Energy Production". New York Times. ^ "U.S. Rejected Solyndra Restructuring Before Shutdown, Memo Says" – via www.bloomberg.com. ^ "Net Metering". Archived from the original on 21 May 2009. ^ "Working Paper Abstract 257 – Energy Institute at Haas - University of California Berkeley, Haas School of Business". ei.haas.berkeley.edu. Retrieved 2015-08-29. ^ Mulkern, Anne C. (September 6, 2011). "Solyndra Bankruptcy Reveals Dark Clouds in Solar Power Industry". The New York Times. Retrieved September 3, 2015. ^ Casey, Tina (October 25, 2013). "$60 Million More For Low Cost Solar Power". Clean Technica. Sustainable Enterprises Media, Inc. Retrieved September 3, 2015. ^ "California: SunShot-Supported Technology Maximizes Taxpayer's Investment". U.S. Department of Energy. January 24, 2014. Retrieved September 3, 2015. ^ "Sunshot Catalyst Challenge Series on Topcoder". Retrieved 2 May 2017. ^ "SunShot $1 per Watt Solar Cost Goal: Mission Accomplished, Years Ahead of Schedule". 2017-01-25. Retrieved 2017-01-30. ^ "LACSD Website - Homepage". ^ 635 GW Possible with U.S. Political Shift Archived 2007-09-26 at the Wayback Machine Renewable Energy Access, 2 May 2007. ^ "U.S. Renewable Energy Technical Potentials" (PDF). National Renewable Energy Laboratory. Retrieved 1 December 2016. ^ "Electricity Consumption". Energy Information Agency. Retrieved December 28, 2016. ^ "Total Energy Consumption 2010". Energy Information Agency. Retrieved December 28, 2016.